Letting go doesn’t mean you don’t care about someone or something anymore; it’s just realizing that the only thing you truly have control over is yourself, right here, right now. It’s a necessary process of adapting to the ever-changing realities of life – leaving behind the past to make way for the present. Here are 50 quotes gathered from recent entries in our blog archive that will help you let go and live well. As we grow older and wiser, we begin to realize what we need and what we need to leave behind. Sometimes walking away is a step forward. You will never achieve what you are capable of if you’re too attached to things you’re supposed to let go of. Sometimes there are things in our lives that aren’t meant to stay. Sometimes the changes we don’t want are the changes we need to grow. Growth and change may be painful sometimes, but nothing in life is as painful as staying stuck where you don’t belong. The hardest part about growing is letting go of what you were used to, and moving on with something you’re not. It’s usually quite hard to let go and move on, but once you do, you’ll feel free and realize it was the best decision you’ve ever made. You can’t always wait for the perfect moment. Sometimes you must let go and dare to do it because life is too short to wonder what could have been. You’re not the same person you were a year ago, a month ago, or a week ago. You’re always growing. Experiences don’t stop. That’s life. One of the most rewarding moments in life is when you finally find the courage to let go of what you can’t change. Never force anything. Give it your best shot, and then let it be. If it’s meant to be, it will be. Don’t hold yourself down with things you can’t control. When you stop expecting people and situations to be perfect, you can start to appreciate them for who and what they are. Live simply. Love generously. Speak truthfully. Breathe deeply. Do your best. Leave everything else to the powers above you. Giving up and moving on are two very different things. Moving on doesn’t mean forgetting, it means you choose happiness over hurt. Giving up doesn’t always mean you’re weak; sometimes it simply means you are strong enough and smart enough to let go and grow. Whatever is bringing you down, let it GO! You don’t need that negativity in your life. Keep calm and be positive. Good things will happen. Some people cannot stand that you’re moving on with your life and so they will try to drag your past to catch up with you. Do not help them by acknowledging their behavior. Keep moving forward. No matter how you live, someone will be disappointed. So just live your truth and be sure YOU aren’t the one who is disappointed in the end. Love yourself! Forgive yourself! Accept yourself! You are YOU and that’s the beginning and the end – no apologies, no regrets. One of the most freeing things we learn in life is that we don’t have to like everyone, everyone doesn’t have to like us, and it’s perfectly OK. Try not to take things other people say about you too personally. What they think and say is a reflection of them, not you. If you care too much about what other people think, in a way, you will always be their prisoner. Sometimes we expect more from others because we’d be willing to do that much for them. Keep loving. You’ll learn who’s worth it in the end. Not everyone will appreciate what you do for them. You have to figure out who’s worth your attention and who’s just taking advantage of you. Saying yes to happiness means learning to say no to the people and things that hurt you. Be wise enough to walk away from the negativity. What you allow is what will continue. It’s better to be lonely than allow negative people and their opinions derail you from your destiny. If you feel like your ship is sinking, it might be a good time to throw out the stuff that’s been weighing it down. Let go of people who bring you down, and surround yourself with those who bring out the best in you. You have to understand that people come and people go. That’s life. Stop holding on to those who have let go of you long ago. Sometimes we don’t forgive people because they deserve it. We forgive them because they need it, because we need it, and because we cannot let go and move forward without it. The first to apologize is the bravest. The first to forgive is the strongest. The first to move forward is the happiest. Be wise enough to let go when you should and strong enough to hold on when you must. Don’t let dumb little things break your happiness. True wealth is the ability to experience and appreciate each moment for what it’s worth. Life is too short to spend at war with yourself. Practice acceptance and forgiveness. Letting go of yesterday’s troubles is your first step towards happiness today. Worry gives small things a big shadow. In the end, you can either focus on what’s tearing you apart, or what’s holding you together. Old worries are down payments on problems you may never have. Let them go. Today is a NEW beginning; take a deep breath and START AGAIN. Smile, even when it feels like things are falling apart. Smiling doesn’t always mean you’re happy; sometimes it simply means you’re strong. There comes a time when you have to stop thinking about your mistakes and move on. No regrets in life – just lessons that show you the way. Remember the good times, be strong during tough times, love always, laugh often, live honestly, and be thankful for each new day. You can’t let one bad moment spoil a bunch of good ones. Don’t let the silly little dramas of each day get you down. If you are diligent and patient, everything you truly need in your life will come to you at the right time. Everything will fall into place eventually. Until then, learn what you can, laugh often, live for the moments, and know it’s all worthwhile. What’s your favorite quote or personal saying that has helped you let go and live well? Please share it with us by leaving a reply below. It doesn’t matter how you fall. What matters is how you get up and fight for what you want. I wanted to thank you. I read what you wrote a million times, through my hardest times. I learned through you how to me mentally so strong. When something bad happens I stay focused and repeat those words in my head till I end up being what I repeat myself . At the end, you become what you think all day long. I’m 20 years old, and I’ve never been that strong. And you know what’s even better? I will never stop getting stronger. Thanks again and not only from me, but from all the people that I inspired with your help. You changed my life, and you will continue having such a great impact on people. It’s priceless. People grow through adversity, they find out what they are made of. It can be bitter at the time, but the sweetness comes later. Passing on positive experience comes from enduring the tough times. We learn how to cope and by growing through the tough times, the lessons we learn help us to see things in a different light. The stronger you get the smaller the trials seem to be. What is tough for some is a walk in the park for those who have already been there and have grown because of it. When things seem to be falling apart, they may actually be falling into place. I really love this one, Pam, thank you. Thanks Marc and angel for a very productive tips about life. My Mother had a favorite quote. Does anyone recognize this and can give me the source? Not as we take, but as we give. Not as we pray, but as we live. These are the things that make for peace from now till time shall cease. Thank you! #4 says it all. “Growth and change may be painful sometimes, but nothing in life is as painful as staying stuck where you don’t belong.” – Don’t get stuck simply because you are afraid to move on. Have the dignity to let go and move on from people that are stopping you. These quotes really helped me, especially #39… it really hit me. Thanks Marc and Angel. The things we go through in life only make us stronger and shape us to who we are today. Women are like tea bags, you never know how strong they are until you put them in hot water. A behavioral change can seem daunting, but why does it have to be harder than any other day to day choices you make. Some choices are made without a second thought as they are familiar. What’s amazing is to be able to acknowledge a behavior that you want to change and change it. We are never limited, we are never stuck. Our inherent God given power is unlimited. Have faith in yourself that you are already making the changes you feel you need to make to attract whatever and whomever, into your life. Believe in yourself. Things sometimes appear as if they will never get better – that I always won’t have a job and that I’ll be poor. 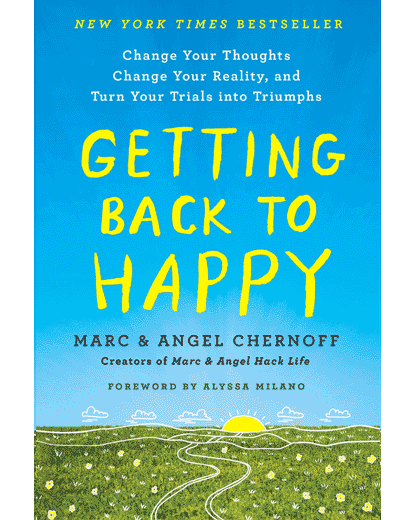 Reading Marc and Angel gives me hope that things will change – and although life seems so unfair to me at times, I can live in the present each day and thank God for the good things I have, and that I have been fortunate through some dark times in the past, and that this will continue. And when things do come right – I’ve promised myself to stay humble and remember where I’ve come from and to look out for people who were in my position. There is nothing like brokenness and healing that comes if you allow it, and don’t let your heart harden. THANKS!! An excellent collection of powerful quotes!! Strength isn’t only what you can take before you break; It’s also what you can take after. Faith in myself and strength are the only things keeping me going anymore. Please help, I am nearing the end. The only good thing about bad times is, that they won’t last forever.. The only bad thing about good times is, that won’t last forever. 2. You cannot trust anyone except yourself. In the end, it is you who will help yourself through it. 3. In life, you can never be sure. Once in a while, take that leap of faith. Sometimes what you are able to attain in life is what you’re willing to walk away from.